1975-1984 40 Series - Open air feeling, stylish contemporary design. 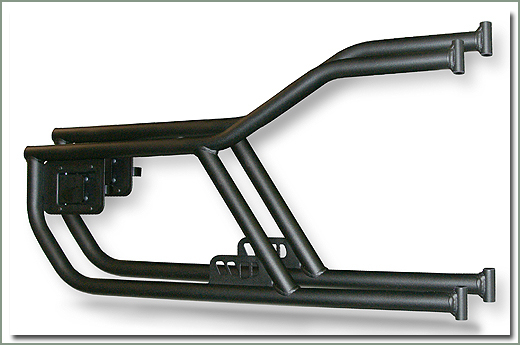 Improves ground visibility during your off-road adventures. 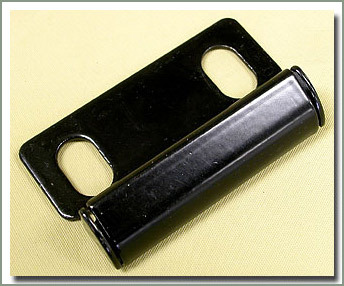 Black Powder Coat finish - Sold in a pair, latches and latch hardware included. 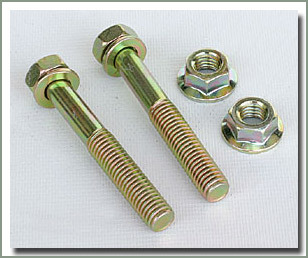 Installation also requires part #273-410 pin & bushing kit, part #273-412 Door striker (qty 2 required), and front striker screws (qty 4 required), order separately if needed. 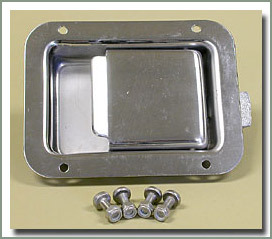 Fits 1975-1984 40 Series - Comes with stainless steel pins (qty 4), and bushings (qty 8) - Does both doors. 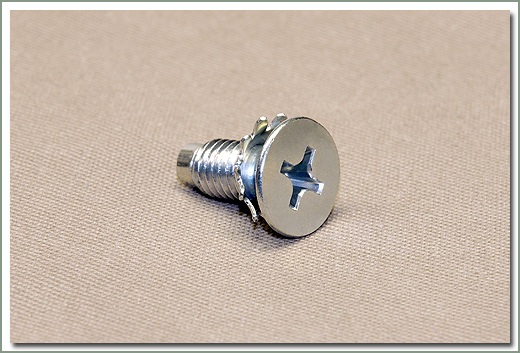 Fits 1975-1984 40 Series - Sold each - Qty 2 required for installation. 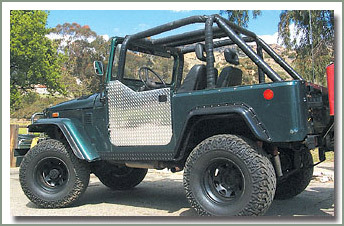 For those of you who want metal half doors, Specter now offers new aluminum Diamond Plate Half Doors. 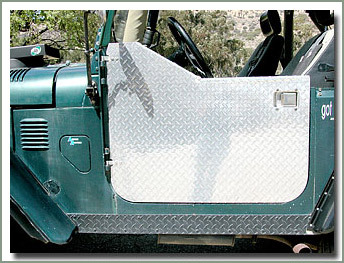 For those who already have many of the aluminium body accessories, these doors will just complete the package. The top edge is rolled and the door is reinforced with an aluminum gusset to add strength. 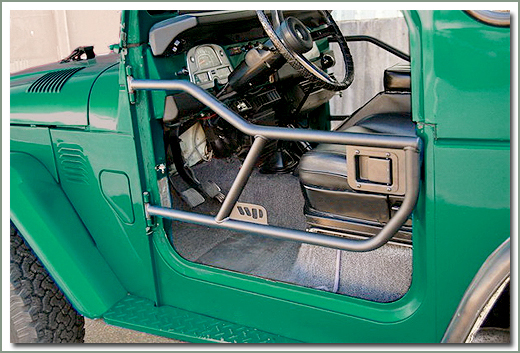 Doors come complete with weatherstrip to keep down the "road rattle". 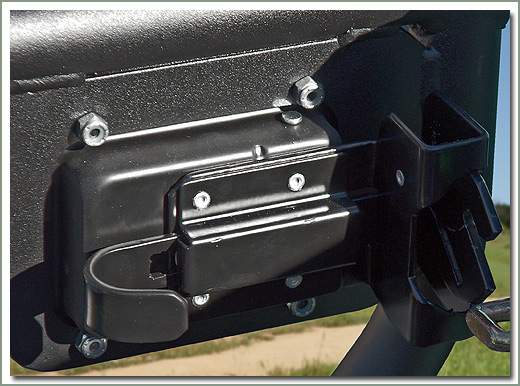 All holes are predrilled and have adjustable pins for your original body side hinges. 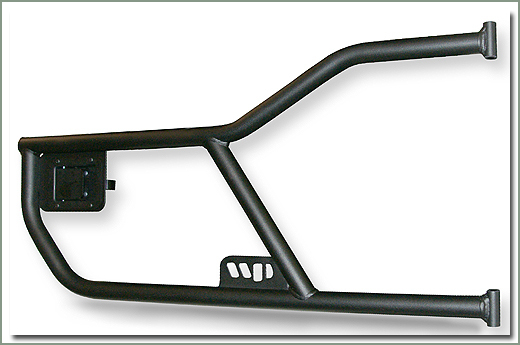 Paddle handle kits must be purchased separately, see #273-225-S. These doors are not designed to be used with SOR Bestop Tigertop. Fits all 1963-1984 40 Series. Sold in pairs. 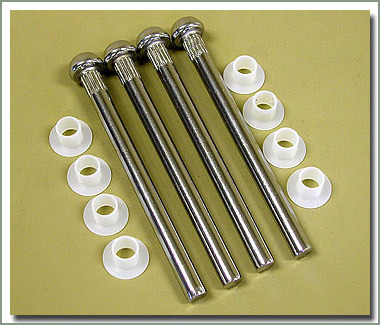 This Handle Kit includes stainless steel paddle handles(qty 2), stainless hardware, and strikers. 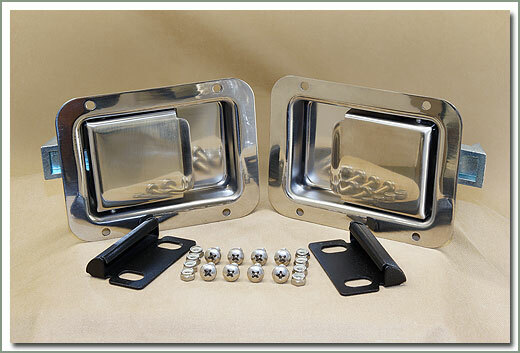 These handles fit the Denim Half Doors (#273-15) and the Aluminum Half Doors (#273-220). 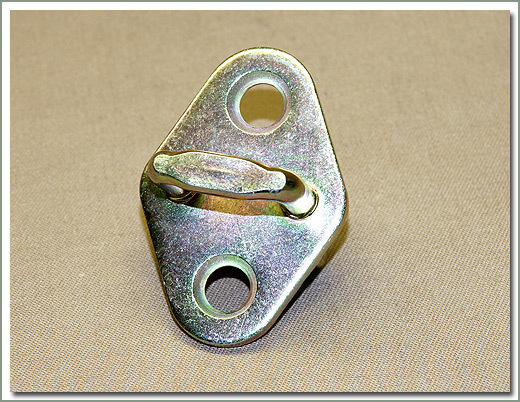 Striker hardware sold separately, order #124-09 qty 2 per side. 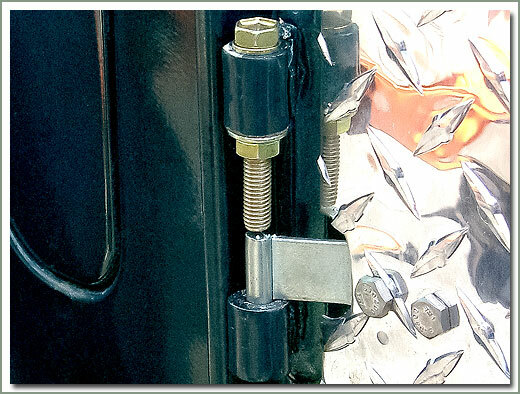 Does not fit the Fastrac Two Piece Doors (#268-840), the Bestop Two Piece Doors (#269-120), and full soft doors because they do not have a inner operating handle. Sold in pairs. 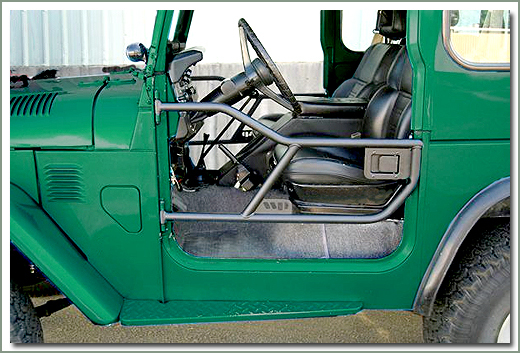 Slows down anyone looking to walk away with your half doors. This kit comes complete with hardware for both doors. 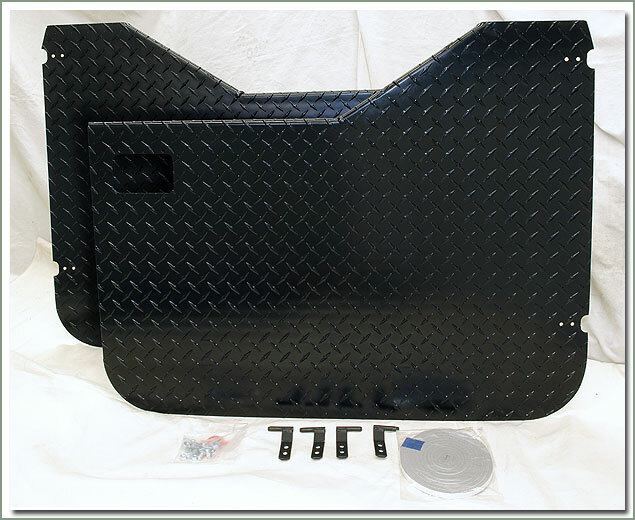 Kit fits Aluminum Half Doors (#273-220), Denim Half Doors (#273-15), Fastrac Two Piece Doors (#286-840), Supertop Two Piece Doors (#269-120) and full softop doors.